1. Preheat the oven to 200°C, gas mark 6. Heat the oil in a large frying pan, cut any large vegetables into smaller pieces and fry, covered, for 5 minutes. Add the tomatoes, cover again, and cook for 5 minutes more. 2. Meanwhile, melt the butter in a small saucepan and add the flour. Cook for 30 seconds before whisking in the milk. Bring to the boil, stirring until thickened and add the mustard and half the herbs. 3. Spread a little of the veg mix on to the base of a square, heatproof dish. 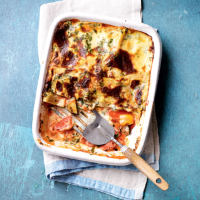 Top with 2 sheets of lasagne. Spoon over half the veg mix and add 2 lasagne sheets. Spread over the remaining veg mix and top with the final 2 sheets of lasagne. Pour over the white sauce and sprinkle with the remaining herbs. Bake for 30 minutes.